Clear all jellies and reach 164000 points to complete the level. This level has medium difficulty. 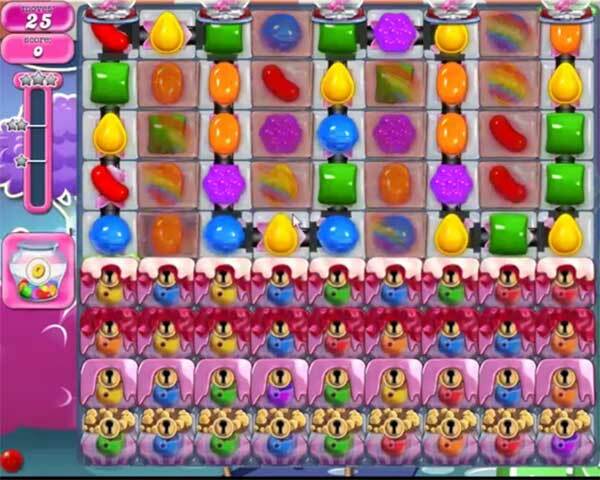 For this level try to play from middle part of the board or from top where more candies available to play and make special candy. Combine special candies with each other or break the jelly as you get the chance. Try to play after more from bottom to shuffle candies as it will help to get more special candy. On level 1246 I haven’t touched the game yet It shows I only have 13 moves to start instead of 25. 25 moves? I only get 13. ????? Only 13 for me too. only 13 for me too!!! I only get 13 moves instead of 25. Correct it! Only 13 moves also! Impossible to complete with that number!! ONLY 13 MOVES ALSO. B.S. Impossible to do in 13 moves!